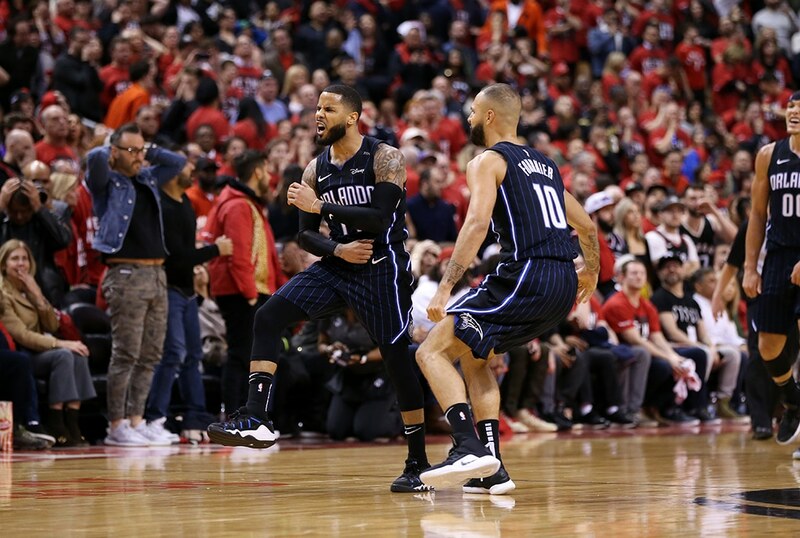 If you rank the starting point guards playing in the 2019 Playoffs, DJ Augustin is probably going to be near the bottom of the list. He’s a serviceable point guard that’s been a steady presence for a surprising Magic team. But he’s not exactly in the same caliber as Steph Curry, Kyrie Irving, Damian Lillard or Russell Westbrook. That imaginary ranking didn’t matter, as Augustin delivered the biggest shot of the Playoffs so far. The Magic stuck to the Raptors all game long. They were scrappy and hardworking, making up for their lack of talent with hustle and energy. That’s why the game was tied all the way to the final possession. With nearly 11 seconds left on the clock, Augustin was setting a play from the top of the key. He got a pick from Nikola Vucevic and as he peeled out of the two-man game, he found himself momentarily open. Without skipping a beat, Augustin launched a three-pointer from the top of the key that splashed in with 3.4 seconds left in the game. That shot gave the Magic a three-point lead and eventually the win. Augustin was one of the best players in the game today. He finished with 25 points on 9/13 shooting and six assists. He matched Kawhi Leonard’s scoring output on better shooting. He thoroughly outplayed his Raptors counterpart, Kyle Lowry, who was held scoreless in the game today. If you rank the starting point guards’ performances in today’s games, Augustin definitely bolts up to near the top of the list (Sorry DJ. Steph still tops the list with his 38-15-7 game.). If he and the Magic continue to play this way, they may end up with more surprises against a Raptors team now playing on their heels. The first day of the Playoffs was filled with a lot of other surprises. Besides the Magic stealing a game, the upstart Nets also travelled to nearby Philly to take Game 1. The best picture of that upset was taken by ESPN’s Dave McMenamin. After the game, he was able to capture the celebratory balloons of the Sixers being stowed away in a giant trash bin. That captures the performance of the Sixers in today’s game. Jimmy Butler showed up for work today. He scored 36 points on 11/22 shooting. Unfortunately, the rest of the team didn’t. Joel Embiid scored 22 points but on a paltry 5/15 shooting. Ben Simmons, Tobias Harris and JJ Redick combined to score 18 points at an 8/23 clip. In contrast, the Nets looked relaxed in their return to the Playoffs. D’Angelo Russell, playing in his first Playoff game led his team with 26 points. Caris LeVert, also playing in his first postseason appearance dropped 23 from off the bench. The Sixers starters need to find their collective rhythm if they want to see those balloons drop on their home floor in the next game. The Spurs are making their 22nd straight Playoff appearance this season. Even if they’re not considered as championship contenders anymore, they’re still considered one of the best teams in the West. The Nuggets are making their first Playoff appearance since 2013. This is a totally new team with no holdovers from that Playoff team six years ago. In today’s match-up between a veteran Playoff figure and new blood in the postseason, experience won out. Perhaps the best play that captured the performance of both teams today was the highlight dunk of Derrick White. White was bringing down the ball and saw an opening in the defense. He drove past the entire Nuggets team who were slow getting back down on defense. In the end, Paul Millsap paid for his team’s lack of energy. The Spurs were coming in as underdogs against one of the best in the West. So, they took every advantage they could and made the Nuggets pay for every turnover, missed shot and defensive lapse. They took a 10-point lead in the first period and protected that advantage all the way to the end. It wasn’t the prettiest way to get the job done, but the Spurs did what they’ve done for the past 22 years: win.